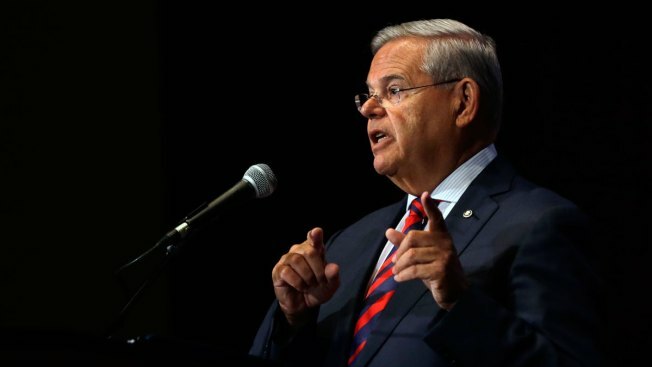 Sen. Robert Menendez is expected to ask the U.S. Supreme Court to toss bribery-related charges against him as early as Monday, NBC 4 New York has learned. Attorneys for the Democrat from New Jersey are set to file a motion asking the judges to overturn an appeals court decision that allowed the federal prosecution to proceed. There is precedent; the Supreme Court threw out the corruption conviction of Virginia Gov. Bob McDonnell. But legal experts have said the issues and charges in the Menendez case do not fit neatly into the 8-0 McDonnell decision. Menendez was indicted in April 2015 for allegedly accepting gifts from a Florida eye doctor in exchange for personal favors but any trial has been delayed as the appeals process continues. Menendez has insisted he is innocent. He has claimed the Speech or Debate clause of the Constitution shields him from federal prosecution in part because he claims his efforts to help the doctor secure business deals were official legislative acts. But the Justice Department has alleged Menendez sold his office by improperly accepting free vacations and campaign cash from Dr. Salomon Melgen in exchange for official favors. The FBI said after getting gifts and donations, the senator then used his office to try to help Dr. Melgen win a $500 million dollar port security deal in the Dominican Republic. Menendez also contacted Medicare officials to try to help the eye doctor avoid paying millions in a billing dispute with the government. Melgen –- who is charged alongside Menendez and in a separate Medicare fraud case –- also denies any wrongdoing. In July, the Third Circuit Court of Appeals in Philadelphia upheld the district court ruling that the senator is not immune from prosecution and that the corruption case should move forward. Since his indictment a year and a half ago, Menendez has continued his work as New Jersey’s senior senator. But he did step down as chair of the Senate Foreign Relations Committee when the charges were first announced.